STI Sinistersubie Subaru Ambassador Kimberly Friedrich aka A Dose Of Dopeness unleashed a beast of a custom Kidrobot Mega Munny! Fueled by petroleum from the depths of HELL, queue the cinematic music! 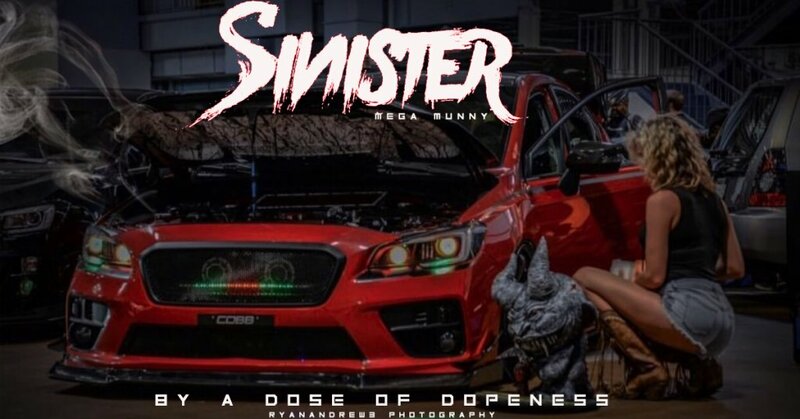 Ok, so that part isn’t true but what is true is Kimberly decided she wanted to make some kind of mascot for her “Sinistersubie” show car (check the beast below) as shes always wanted to do a Mega Munny after sculpting so many little ones. It was time to put her skill onto a Mega Munny. Three months in the making and using 16 pounds of Super Sculpey. I made the interior his horns out of styrofoam to keep him balanced and in an attempt to keep weight down, but he still ended up being about 25 pounds total! Used reg acrylic paint and some Montana spray paint for his base. Check out the texture and Subaru STI markings. Neat idea having tire markings on the back embedded into the Munny. Thank you to Kimberly and our friend Nerviswr3k for hitting us up and putting a spotlight on A Dose Of Dopeness. Like what you see? Need a custom? hit up a dose of dopeness on Instagram. Find a dose of dopeness on Instagram.